When I began piano lessons at the age of eight, note reading was probably my biggest problem. In fact, it took a couple years for me to master the skill of sight reading, but eventually, my ability to read notes improved, and I became a proficient sight reader. As a teacher, I have taught students who struggle with sight reading, and I have taught other students who catch on very quickly to the “new language” of music notes. It is amazing how the Lord blesses each person with different gifts and abilities. As a musician, it is important to recognize your personal strengths and weaknesses and focus on how you can improve in both areas. As someone who once struggled with sight reading, and as a teacher who places much emphasis on sight reading, here are my best suggestions for improving your sight reading skills. The number one best way to improve your ability to sight read is to read as much new music as possible! Take 10-15 minutes a day and just read and attempt to play music you have never seen! Even if you are already proficient in sight reading, you can practice sight reading more difficult selections of music. There is always room for improvement in this area, even for teachers! 2. Familiarize yourself with a variety of rhythm patterns. Sight reading isn’t just about reading the letter names of the notes. You also must know the values of the music notes. Work for confidence in playing a variety of time signatures, and sight read rhythm exercises by tapping, clapping, or using rhythm shakers…whatever works for you! 3. Memorize the key signatures. So many students do not see the importance of recognizing key signatures on sight, but failure to memorize key signatures severely hinders and handicaps a musician. Learn the major keys first and work towards memorizing the minor keys. Think of creative ways to memorize the key signatures, and ask your teacher for helpful suggestions. I promise you will never regret knowing these! 4. Study the music and make written notes. Before you ever play a new piece, try to mentally hear it in your head. Simply study over the music, marking any areas that look challenging. Pencils and highlighters are some of my favorite tools as a pianist and a teacher! I hope these simple suggestions will guide you as you improve your sight reading skills. 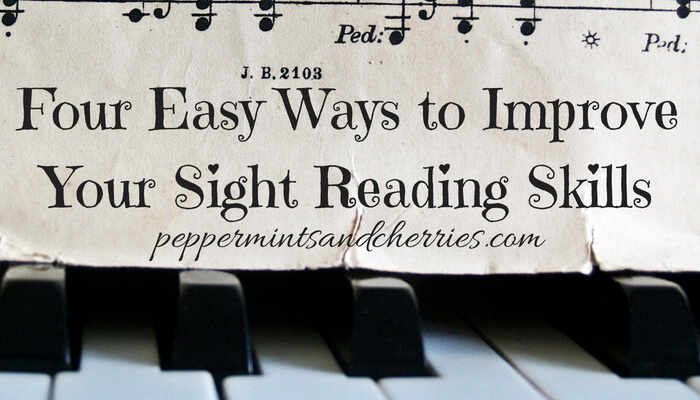 The most important takeaway from this post is that a sight reader must practice sight reading. Simple, yet profound! Click here to read, How to Deal with Stage Fright During A Musical Performance. Pin this Post and Follow Peppermints and Cherries!